This article is about Hsinchu County. For the city, see Hsinchu. Hsinchu County, also romanized in various other ways, is a county in north-western Taiwan. The population of the county is mainly Hakka; there is a Taiwanese aboriginal minority in the southeastern part of the county. Zhubei is the county capital, where the government office and county office is located. A portion of the Hsinchu Science Park is located in Hsinchu County. A county, constitutionally known as a hsien, is an administrative division unit in Taiwan. Under the administrative structure of Taiwan, it is with the same level of a provincial city. Historically the counties were under the jurisdiction of provinces, but after the streamlining of provinces in 1998, they are all directly led by the central government. The Hakka, sometimes Hakka Han, are Han Chinese people whose ancestral homes are chiefly in the Hakka-speaking provincial areas of Guangdong, Fujian, Jiangxi, Guangxi, Sichuan, Hunan, Zhejiang, Hainan and Guizhou. The Chinese characters for Hakka (客家) literally mean "guest families". Unlike other Han Chinese groups, the Hakkas are not named after a geographical region, e.g. a province, county or city, in China. Modern day Hakka are generally identified by different degrees of Hakka ancestry and usually speak the Hakka language. Before the arrival of the Han Chinese, the Hsinchu area was home to Taokas plains aborigines, the Saisiyat, and the Atayal. 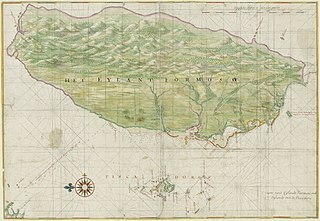 After the Spanish occupied northern Taiwan, Catholic missionaries arrived at Tek-kham in 1626. Minnanese (Hoklo) and Hakka came and began to cultivate the land from the plains near the sea towards the river valleys and hills. Hsinchu, also known by other names, is a city in northern Taiwan. Taokas is one of a number of indigenous ethno-linguistic groups that inhabited the plains of western Taiwan. The Taokas were located in the areas around today's Hsinchu City/Hsinchu County, Miaoli County, and Taichung City region. Several Taokas groups have been historically linked to many revolts that plagued Taiwan during the Qing era (1683–1895). The Taokas were not always opposed to Han encroachment on their lands as several Taokas groups were involved in building the Ta-Chia Mazu Temple. Today, only a small number of people in the central city of Puli identify themselves as ethnic Taokas or even Taiwanese Aborigines. In 1684, Zhuluo County was established during Qing Dynasty rule and more Han settled near Tek-kham. A Chinese city was established there in 1711 and renamed Hsinchu in 1875. It became part of Taipeh Prefecture. In the late 19th century, Hoklo people dominated the coastal plain area, forcing the Saisiyat and Atayal tribes to move to areas around Jianshi and Wufeng, while the Hakka and Taokas settled together in the river valleys and hills area. Zhuluo County was a political division in Taiwan from 1684 to 1787, during Qing Dynasty rule of the island. Initially encompassing the underdeveloped northern two-thirds of Taiwan, the county shrank in size as the population and economy of the north and central western plains grew and new counties were created. In 1787 the county underwent further restructuring and was renamed Chiayi County. Taiwan under Qing rule refers to the rule of the Qing dynasty over Formosa from 1683 to 1895. The Qing court sent an army led by general Shi Lang and annexed Taiwan in 1683. It was governed as Taiwan Prefecture of Fokien Province (Fujian) until the declaration of Fokien-Taiwan Province in 1887. 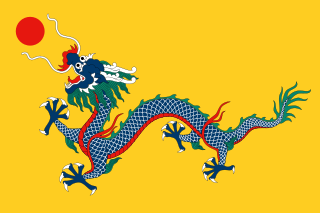 Qing rule over Taiwan ended when Taiwan was ceded to Japan by the Treaty of Shimonoseki in 1895. Taipeh Prefecture was a Qing dynasty prefecture created from the northern part of Taiwan Prefecture, Qing-era Taiwan in 1875, while the island was still part of Fujian Province. It consisted of a region surrounding modern-day Taipei in northern Taiwan, including modern-day Hsinchu, Hsinchu County, Taoyuan City, New Taipei City, Taipei, Keelung, and Yilan County. The reorganization started after Imperial Commissioner Shen Pao-chen demanded that another prefecture be added in Taiwan to revamp the administrative organization of the northern area of the island. The walls of the prefecture capital were completed in 1884. Japanese occupation of Taiwan began after the First Sino-Japanese War in 1895. Hsinchu became known as Shinchiku and, by 1920, its prefecture covered the areas of modern-day Hsinchu County and City, Miaoli, and Taoyuan. 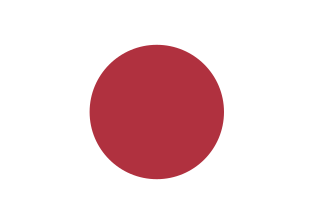 Japanese Taiwan was the period of Taiwan and the Penghu Islands under Japanese rule between 1895 and 1945. The First Sino-Japanese War was fought between China and Japan primarily over influence in Korea. After more than six months of unbroken successes by Japanese land and naval forces and the loss of the port of Weihaiwei, the Qing government sued for peace in February 1895. Shinchiku Prefecture was one of the administrative divisions of Taiwan during the Japanese era. The prefecture consisted of modern-day Hsinchu City, Hsinchu County, Taoyuan City, and Miaoli County. As a result of the surrender of Japan at the end of World War II, the island of Taiwan was placed under the governance of the Republic of China (ROC), ruled by the Kuomintang (KMT), on 25 October 1945. Following the February 28 massacre in 1947, martial law was declared in 1949 by the Governor of Taiwan Province, Chen Cheng, and the ROC Ministry of National Defense. Following the Chinese Civil War in 1949, the ROC government was forcibly expelled from the mainland by the Communists, who proclaimed the establishment of the People's Republic of China. The KMT retreated to Taiwan and declared Taipei the temporary capital of the ROC. For many years, the ROC and PRC each continued to claim in the diplomatic arena to be the sole legitimate government of "China". In 1971, the United Nations expelled the ROC and replaced it with the PRC. The Republic of China (ROC) controlled the Chinese mainland between 1912 and 1949. It was established in January 1912 after the Xinhai Revolution, which overthrew the Qing dynasty, the last imperial dynasty of China. 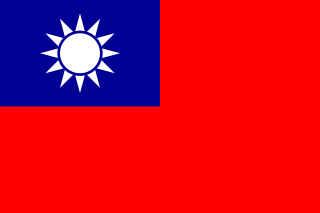 Its government moved to Taipei in December 1949 due to the Kuomintang's defeat in the Chinese Civil War. The Republic of China's first president, Sun Yat-sen, served only briefly before handing over the position to Yuan Shikai, leader of the Beiyang Army. His party, then led by Song Jiaoren, won the parliamentary election held in December 1912. Song Jiaoren was assassinated shortly after and the Beiyang Army led by Yuan Shikai maintained full control of the Beiyang government. Between late 1915 and early 1916, Yuan Shikai tried to reinstate the monarchy before abdicating due to popular unrest. After Yuan Shikai's death in 1916, members of cliques in the Beiyang Army claimed their autonomy and clashed with each other. During this period, the authority of the Beiyang government was weakened by a restoration of the Qing dynasty. The county's Xiangshan Township was incorporated into Hsinchu City on 1 July 1982. Colors indicate the common language status of Hakka and Formosan languages within each division. After the founding of Hsinchu Science Park in 1980, a high number of high-tech industries began to grow and expand outside the park, attracting workers coming to work and settle in the county. Education in Hsinchu County is administered by the Education Department of Hsinchu County Government. The county is home to the Minghsin University of Science and Technology and Ta Hwa University of Science and Technology. Hsinchu County is home to the gas-fired Hsintao Power Plant with a capacity of 600 MW located in Guanxi Township. Hsinchu County houses the Baoshan Dam, supplying cooling water for factories in the Hsinchu Science Park and neighboring Hsinchu City. The dam can contain water up to 5,470,000 m3 with a catchment area of 3.2 km2 (1.2 sq mi). The Hsinchu Station of the Taiwan High Speed Rail is located in the county at Zhubei City. Hsinchu County is crossed by three Taiwan Railways Administration lines, which are the Liujia Line, Neiwan Line and Western Line. Miaoli County is a county in western Taiwan. Miaoli is adjacent with Hsinchu County and Hsinchu City to the north, Taichung to the south, and borders the Taiwan Strait to the west. The Council for Economic Planning and Development of Taiwan classifies Miaoli as a county of Central Taiwan, while the Taiwan Central Weather Bureau classifies Miaoli as a county of the North. Miaoli City is the capital of the county, and is also known as "Mountain Town", owing to the number of mountains nearby, making it a destination for hiking. Zhubei is a county-administered city and the county seat of Hsinchu County, Taiwan. Over the recent years, Zhubei has become a popular city for migration both because of its proximity to Hsinchu City and the Hsinchu Science and Technology Park, and because the Hsinchu County government has focused most of its infrastructure here. Zhunan Township is an urban township in northern Miaoli County, Taiwan. Miaoli City is a county-administered city and the county seat of Miaoli County, Taiwan. Its name Miaoli was coined using two Hakka words, cat (貓) and city (裡), which phonetically approximate Pali (Bari) from the Taokas language. Miaoli has a relatively high percentage of Hakka people. It had the second highest residential price and the highest commercial price for land in Miaoli County as of 2004, at NT$28,601 per square meter and NT$63,317 per square meter, respectively. Provincial Highway 68 is an expressway, which begins in Hsinchu City at Nanliao on the Provincial Highway No. 15 and ends in Zhudong on Zhongfeng Road. Saisiyat is the language of the Saisiyat, a Taiwanese indigenous people. It is a Formosan language of the Austronesian family. It has approximately 4,750 speakers. Dabajian Mountain is located in the northern section of the Shei-Pa National Park in Hsinchu County, Taiwan. It is surrounded by numerous other peaks, the most predominant including Mount Nanhuda, Mount Yize, Central Range Point, Mt. Pintian, and Mt. Mutule. It is also near the Madala River. Baoshan Township is a rural township in Hsinchu County, Taiwan. It is ostensibly a suburb of Hsinchu City to the north and west, and is also bounded by Zhudong City to the east, Beipu and Emei Towns to the south, and Miaoli County to the west. 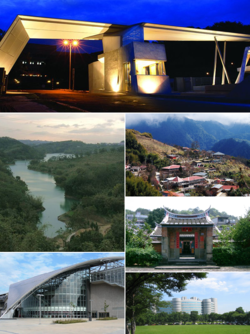 Guanxi Township or Guansi Township is an urban township in Hsinchu County, Taiwan. The population of the township consists mainly of the Hakkas with a minority of the indigenous Atayal people. Zhudong Township is an urban township in central Hsinchu County, Taiwan. Part of Hsinchu Science Park is in Zhudong. Also located in Zhudong is the main campus of the Industrial Technology Research Institute (ITRI). Zhudong is approximately 20 minutes drive from Hsinchu town center on one of two freeways, route 3 North, which passes nearby and route 68 East which proceeds directly through Zhudong. Hsinchu is a railway station in Hsinchu County, Taiwan served by Taiwan High Speed Rail. It opened for service in 2006. The station was designed by Taiwanese architect Kris Yao. Xinfeng Township is a rural township in Hsinchu County in northern Taiwan. It had an estimated population of 56,484 as of January 2017. Beipu Township is a rural township in Hsinchu County, Taiwan. Beipu is well known in Taiwan as a center of Hakka culture, especially for production of dongfang meiren tea and its special Hakkanese blends of tea and nuts called lei cha. Sanwan Township is a rural township in northern Miaoli County, Taiwan. It lies between the Taiwan Strait on the west and mountains on the east. Wufeng Township is a mountain indigenous township in Hsinchu County, Taiwan. The Beipu Incident, or the Beipu Uprising, in 1907 was the first instance of an armed local uprising against the Japanese rule of the island of Taiwan. In response to oppression of the local population by the Japanese authorities, a group of insurgents from the Hakka subgroup of Han Chinese and Saisiyat indigenous group in Hokuho, Shinchiku Chō, attacked Japanese officials and their families. In retaliation, Japanese military and police killed more than 100 Hakka people. The local uprising was the first of its kind in Taiwan under Japanese rule, and led to others over the following years. The history of Hsinchu extends over more than 400 years, making it one of the oldest cities in northern Taiwan. Hsinchu's legislative districts consist of into 2 single-member constituencies, each represented by a member of the Republic of China Legislative Yuan. From the 2020 legislative election onwards, the number of Hsinchu County's seats was increased to 2 due to the county's increase in population, as it exceeded the 315,019 average for each constituency. ↑ Wang, Erika (25 October 2007), "Hsinchu Owns Rich History, Culture, and Natural Resources", China Post, Taipei: China Post . ↑ "Hsinchu County Government Hsinchu County Government". Hsinchu County Government. ↑ "Towns & Townships". hsinchu.gov.tw. Hsinchu County Gov't. Retrieved 4 February 2017. ↑ "Population". hsinchu.gov.tw. Hsinchu County Government. Retrieved 27 February 2017. ↑ 106年1月 新竹縣人口統計報表 [Table of Hsinchu County Population Statistics, January 2017]. hsinchu.gov.tw (in Chinese). Hsinchu County Government. Retrieved 27 February 2017. Wikimedia Commons has media related to Hsinchu County .